At the tender age of 49 I am still petrified to go to the dentist. It never matters what I'm having done. The thought of a simple cleaning makes me cold and clammy. It's not that my current dentist has ever caused me a great deal of pain. He and his staff are fantastic. I am afraid of going to the dentist today because I had a terrible dental experience as a child. I really think that the dentist featured in this story is on to something! Learn more after the jump. Dr. Paul Weiss, a pediatric dentist in Williamsville, New York has trained his Golden Retriever Brooke to be a therapy dog. Brooke's job is to calm and soothe anxious young patients. Brooke, who is four years old, keeps office hours every Thursday and is always in the company of an adult staff member. She plays fetch with kids, and if a child is really apprehensive about a procedure, Brooke will actually sit in the chair with them. 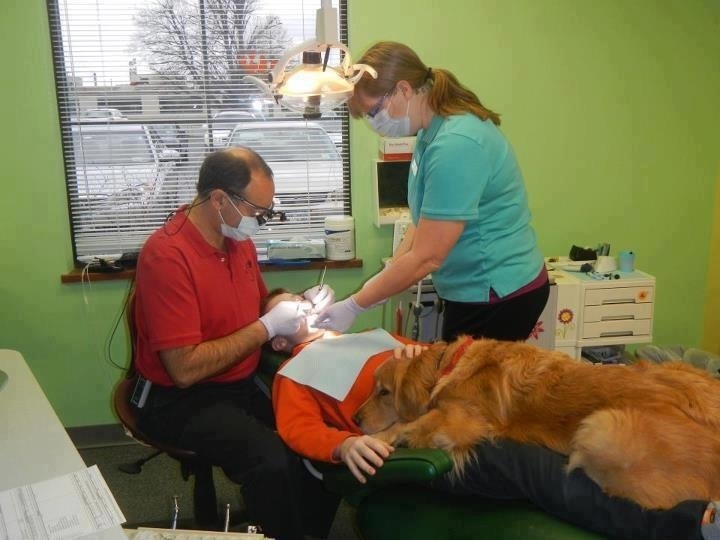 "If a child is afraid of getting her teeth cleaned, Brooke can sit next to them in the chair and the kid can have their hand on the dog." Dr. Weiss says. Parents and patients are told in advance that there will be a dog present in case there are allergies, and Brooke is given a bath before every office visit. "Patients look to come back on a Thursday." Dr. Weiss enthuses. "If demand increases, we may have to up her hours." Have you or your children ever had a bad experience at a dentist's office? Do you think that Dr. Weiss's idea of having a therapy dog in the office to calm his young patients is a good one?